FILE - A Pakistani soldier stands guard while a loaded Chinese ship prepares to depart Gwadar port, about 700 kilometers (435 miles) west of Karachi. Pakistan, Nov. 13, 2016. 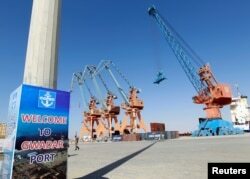 FILE - A general view of the port before the inauguration of the China Pakistan Economic Corridor port in Gwadar, Pakistan Nov. 13, 2016.